Focus on the vitality and diversity of Native nations and the value of indigenous knowledge. Study the effects of European-American social values and structures on Native history and contemporary life. Examine global effects of colonialism and treaty relationships between tribal nations and settler governments. The first building in The Longhouse’s indigenous arts campus efforts is a carving studio in the shape of a replica longhouse. Native American and Indigenous Studies at Evergreen is an interdisciplinary field that examines the histories, cultures, politics, and contemporary experiences of Indigenous peoples in the Northwest and beyond. Founded upon visionary leadership and long-term relationships between Pacific Northwest tribes and Evergreen, programs in Native studies embrace indigenous knowledge as a field of multidisciplinary study. Faculty develop culturally relevant curriculum that strengthens the college's connection to indigenous peoples of the United States, Canada, Aotearoa, and the Pacific Rim. Classes take place both on the Olympia campus and at area tribal centers. The Evergreen State College Longhouse partnered with the Squaxin Museum to host the Paddle to Squaxin Tribal Journey in 2012. As you learn about Native studies, you will get experience combining theory with practice. Learn from indigenous Pacific Rim artists in the Longhouse’s carving studio. Explore the canoe as transportation, cultural artifact, and symbol of sovereignty and nation-building through a tribal canoe journey. Learn issues of tribal governance, economic sustainability, and self-determination from tribal leaders and policy makers. Truly interdisciplinary, Native studies supports students in developing and strengthening quality skills in analysis, research, writing, and oral communication in their chosen fields. In this introductory program, we will explore the nature and structure of language, and the ways in which patterns of language use within Native communities and colonial structures have reflected history, politics, and power relationships. We will consider Northwest and North American cultures and communities. Museum trips, films, text, and discussions will help you develop a variety of skills, including historical research, linguistic analysis, and policy research and writing. An artist carves a design onto linoleum. When she is finished, it will be covered in ink and used to create printed design pieces. Students break into small groups to talk about challenges and opportunities for Native American health care. The session was part of regular classes known as Battlegrounds, which draw together students from eight regional reservations that participate in the program. Consider continuing your education at the only MPA tribal governance concentration in the country. A gathering place for indigenous arts and cultures through education, cultural preservation, creative expression, and economic development. Participate in multicultural classes, presentations, performances, and more. Meet Native artists and visit exhibitions and art sales throughout the year, including the annual winter holiday arts and crafts fair. The Longhouse is part of a larger Indigenous Arts Campus, which includes a Carving Studio and Fiber Arts Studio. 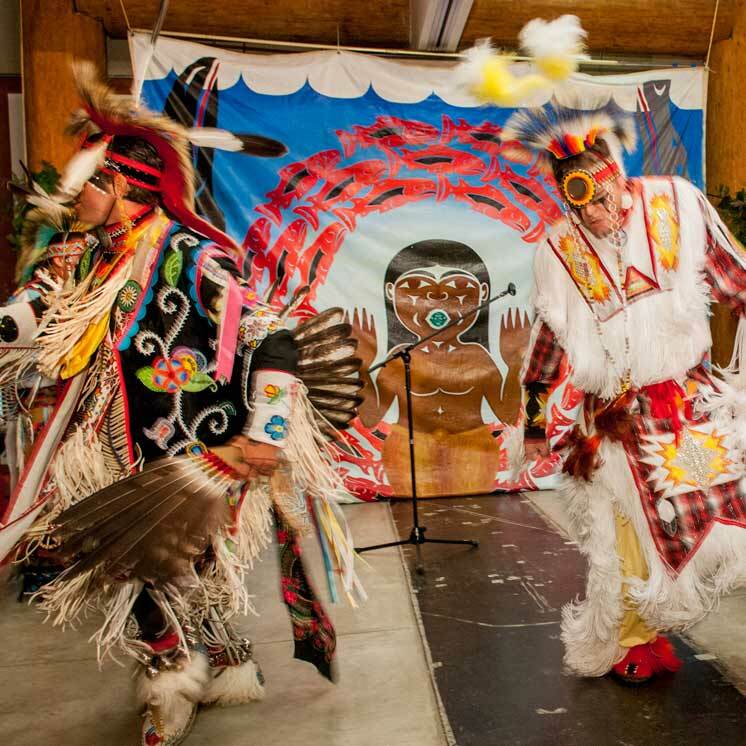 Participate in multicultural classes, presentations, performances, and more at The Longhouse. Indigenous Pacific Rim artists-in-residence teach and practice in the Longhouse’s carving studio. Discover the full range of activities at The Longhouse. Classes take place on Indian reservations in western Washington. Students attend weekly classes at reservation sites and also attend Saturday classes at the Longhouse, where all students come together for classes, workshops, and cultural events. Explore the Native Pathways Program. Consider continuing your education at the only MPA tribal governance concentration in the country. We provide current and future tribal leaders with the knowledge and skills needed to work successfully in Indian Country. The degree prepares students for a wide range of jobs in tribal, federal, state, and local governments, and nonprofits. Learn more about the MPA program. Zoltan Grossman teaches Native American studies with an emphasis on global ethnic relations and world indigenous peoples. His expertise also includes U.S. race relations, environmental justice and movements, maps and historical cartography, globalization, and military interventions. He earned a Ph.D in geography in 2002, an M.S. in geography in 1998, and a B.A. and B.S. in history and geography in 1984, all from the University of Wisconsin. Frances V. Rains teaches Native American studies with an emphasis on education, history, and women’s studies. Her expertise includes indigenous knowledge, decolonization, indigenous sustainability, critical race theory, and qualitative research methods. She earned a Ph.D in curriculum and instruction/curriculum theory/multicultural education-elementary education in 1995, an M.S. in elementary education/mathematics in 1987, and a B.S. in elementary education/American Indian education in 1978, all from Indiana University. Gail Tremblay is of Onondaga and Micmac ancestry. She teaches Native American studies with an emphasis on the visual arts, creative writing, and poetry. A prolific author and internationally exhibited artist, her expertise includes art, weaving, art history, contemporary Native American literature, poetry, literature, multicultural literature, and diversity and gender equity in art education. She earned an MFA in English (poetry) from the University of Oregon in 1969, and a B.A. in drama from the University of New Hampshire in 1967.